It’s been a little over two years since the Marlins and Blue Jays completed the mega-trade that sent $163.75MM in major league veterans north of the border for a bundle of prospect joy. The Marlins were roasted for the decision at the time, but it’s looking wiser by the day, writes Joe Frisaro of MLB.com. Not only did the move clear much needed payroll (since used on Giancarlo Stanton), it also accounts for a lot of the top talent in the organization. In addition to Henderson Alvarez, Adeiny Hechavarria, and Justin Nicolino, the Fish netted seven more players using pieces traced to the original trade with the Jays. Brewers prospect Devin Williams is now represented by the Beverly Hills Sports Council, tweets Jon Heyman of CBS Sports. Williams was the Brewers second round pick in 2013, and Heyman adds he’s one of Milwaukee’s top 10 prospects. Williams, 19, pitched to a 4.48 ERA with 8.95 K/9 and 2.71 BB/9 in the rookie level Pioneer League. The White Sox are still looking into trading outfielder Dayan Viciedo, writes Scott Merkin of MLB.com. Needs include bullpen and bench depth. The ongoing Max Scherzer saga could greatly affect the Tigers in 2015, writes Jason Beck of MLB.com. Per Beck, the Tigers are likely to let Scherzer walk if another club shows heavy interest. If he continues to float on the market as he is now, there will be increasing pressure to bring him back. Owner Mike Illich is known for his penchant to reward players who have performed well in Detroit. Left field is an obvious hole for the Rangers, writes T.R. Sullivan of MLB.com. The internal candidates are Michael Choice, Ryan Rua, and Jake Smolinski, but don’t be surprised if additional depth is added. The club is also expected to add a catcher to compete with Robinson Chirinos. Shortstop continues to be a glaring flaw on the Mets roster, writes Anthony DiComo of MLB.com. Last year, the club was unsuccessful upgrading over Ruben Tejada. This time, Wilmer Flores is the guy on the hot seat, with Tejada still in the picture too. My own take: unless the Mets can pinch Troy Tulowitzki, they’ll enter the season with Flores and Tejada. In the grand scheme of major league shortstops, neither projects to be terrible. Meanwhile, if they wanted Stephen Drew, they’ve had plenty of opportunities to acquire him over the last 14 months. Grant Brisbee of SB Nation lists 13 of the biggest holes facing MLB clubs. 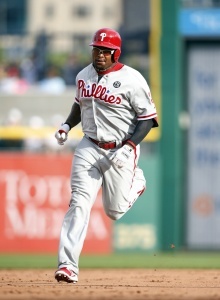 Since the article was published, the Reds added a left fielder and the Phillies became even weaker. My favorite is Diamondbacks catcher. Currently, that’s Tuffy Gosewisch with Rule 5 pick Oscar Hernandez serving as the backup. Despite learning earlier tonight that the Orioles are seeking to add more catching depth, they do have five on the active roster. I’d be willing to bet somebody like Steve Clevenger, Ryan Lavarnway, or a cast-off from another organization will filter into Phoenix before the end of spring training. Personal connections between players and evaluators can affect transactions, writes Nick Piecoro of the Arizona Republic. Knowing an individual can create a comfort level because so much of baseball is based on character and competitive drive. One NL scout said: “If you just look around, there’s normally a connection there with somebody who is acquiring, they know the guy and sometimes it helps the trade develop.” The article is chock full of good quotes and observations on the topic. The opening is especially pertinent to fans of the Diamondbacks, Dodgers, and Padres. The Seth Smith trade worked out nicely for San Diego, writes Jeff Sanders of the San Diego Union-Tribune. They get out from under $12MM owed to Smith while acquisition Brandon Maurer remains club controlled for five seasons. The Friars may give Maurer a chance to start, but he could also be groomed for late inning relief. The Padres have overhauled their roster, but there’s still no clear leadoff hitter, writes Corey Brock of MLB.com. It’s possible that could be the next target for GM A.J. Preller. Internal candidates like Will Venable and Yangervis Solarte were discussed for the role prior to the flurry of trades. Both appear to be backups now. Catcher Derek Norris has the on base percentage for the job, if not the classic speed associated with batting first. As the Rockies enter the new year, the attention is on newly signed catcher Nick Hundley, writes Thomas Harding of MLB.com. It’s presumed that the move will make it easier to send bat-first catcher Wilin Rosario to the American League. While the Rockies claim they need to be blown away for Rosario, this type of move often presages a transaction. Trading Byrd could open the door for some young guys in Philadelphia, writes CSN Philly’s Jim Salisbury. In particular, Domonic Brown, Darin Ruf, and Rule 5 pick Odubel Herrera stand to benefit the most. Brown’s role is uncertain after a difficult 2014, and Ruf has rarely received consistent work at the major league level. Herrera has some interesting upside if he can stick for the season. Other outfielders under contract include Grady Sizemore, Jeff Francoeur, Xavier Paul, and Brian Bogusevic. Ben Revere’s role is far more solidified. The trade was also about adding pitching depth, says Salisbury. Along with the Rollins deal, Philadelphia has added three solid pitching prospects to the upper minors in Ben Lively, Zach Eflin, and Tom Windle. That sort of depth is important, especially with Cole Hamels on the trade block. Presumably, Cliff Lee just needs to demonstrate health before joining Hamels on the block. The Phillies could be on the verge of adding two starting pitchers, writes Salisbury in a separate piece. One of those names is likely Wandy Rodriguez, who reportedly reached an agreement pending a physical late last week. The other could be Aaron Harang, who Salisbury tweeted about earlier today. As with the pitching prospects listed above, it’s important for a rebuilding club to have enough arms to absorb the roughly 1,450 innings thrown in a major league season. Players like Rodriguez and Harang can also serve as additional trade bait. Roberto Hernandez filled that role last season. Orioles manager Buck Showalter is scheduled to meet with free agent outfielder Colby Rasmus, tweets Eduardo A. Encina of the Baltimore Sun. Rasmus has been frequently connected to the Orioles in recent weeks. His power is a good fit for notably home run friendly Camden Yards. There are plenty of red flags with Rasmus, such as the Blue Jays decision to bench him down the stretch last season. Chemistry is important to Showalter, which is why he’ll go to meet Rasmus at his Georgia home. The Orioles missed on one of their outfield targets – Seth Smith – but they’re still in on Rasmus and Ichiro Suzuki, reports Eduardo A. Encina of the Baltimore Sun. The O’s hope to lure Rasmus with a one-year platform deal, much as they did with Nelson Cruz last season. If they’re forced to turned to Ichiro, he could potentially fill their void at leadoff. Baltimore is looking to add depth to the bullpen and at catcher, tweets Roch Kubatko of MASNsports.com. As Kubatko alludes, the interest in catcher is curious since there are already five on the 40-man roster. The club is exploring major and minor league deals, which could indicate a need for minor league backstops. Trade talks were initiated during the GM Meetings in November, writes MLB.com’s Mark Sheldon. GMs Walk Jocketty and Ruben Amaro continued to work closely on the deal over the last couple weeks. Philadelphia’s decision to include $4MM likely played a large role in netting a strong return. Reds manager Bryan Price praised Byrd’s intangibles, reports Sheldon. According to Price, Byrd will fill a much needed role of run producer, but he can also help the club build a professional culture. Jocketty also acknowledged Byrd’s work ethic and leadership. ESPN’s Keith Law likes the trade for Philadelphia. They continue the much needed mission of rebuilding, and the return is about as good as can be expected for Byrd. The Reds perspective is a lot harder to support. They’re walking a fine line between rebuilding and contending, but it seems like they’re getting the worst of both worlds. For what it’s worth, I suspect the Reds plan to re-sell Byrd at the trade deadline. If he’s not performing well enough to be traded, they can bench him to avoid the vesting option (which triggers in 550 plate appearances). Jocketty says the Reds will focus on adding to the bullpen and bench, writes C. Trent Rosencrans of the Cincinnati Enquirer. The Byrd deal crosses left-fielder off the club’s to-do list. I would add rotation depth as another area of concern. Zaidi says the club has no plan to add more starting pitching prior to the season, tweets Ken Gurrick of MLB.com. The club is comfortable turning to Joe Wieland and Mike Bolsinger as depth, tweets Bill Shaikin of the Los Angeles Times. Any additions will also be depth pieces (Twitter link). If true, this seemingly eliminates the Dodgers as a destination for Max Scherzer, James Shields, and Cole Hamels. The Dodgers have discussed recently designated shortstop Erisbel Arruebarrena with clubs before today, tweets Shaikin. Zaidi says Arruebarrena has come up in talks with three to five clubs (via Twitter). The additions of Jimmy Rollins, Howie Kendrick, and Enrique Hernandez made Arruebarrena expendable. My own two cents: the Phillies have a gaping hole at shortstop, but I assume Arruebarrena came up during the Rollins trade talks. That could mean Philadelphia isn’t interested in the Cuban. Also per Zaidi, the Dodgers aren’t pursuing any free agent relievers. Any addition would come via trade, according to Mark Saxon of ESPN Los Angeles (Twitter). The Rays are in a tough spot with utility fielder Ben Zobrist, writes Richard Justice of MLB.com. On the one hand, big seasons from a couple key personnel could allow the Rays to compete in the AL East. Tampa Bay is accustomed to competing in a tough environment with under-the-radar talent. However, Zobrist is a free agent after 2015. One of GM Matt Silverman’s top tasks is to buff the farm system, and a Zobrist trade could certainly contribute. FanGraphs’ Jeff Sullivan points to Jason Heyward as a comparable trade piece. The Yankees are heading in an odd direction – they’re getting younger, writes FanGraphs’ Drew Fairservice for FOX Sports. While the Bronx Bombers have a history of leaning on established veterans, they’ll turn to a number of relative unknowns in 2015. Among those are shortstop Didi Gregorius, second baseman Rob Refsnyder, and pitcher Nathan Eovaldi. The result is a highly volatile roster. We could witness an unexpectedly competitive season if the ball bounces the right way, but the Yankees could also end up in the basement. Not everything depends on youngsters. The club could use a “dead cat bounce” from a number of its veterans like Brian McCann, C.C. Sabathia, and Carlos Beltran. The Red Sox are beyond the $189MM luxury tax threshold for next season, reports the Boston Herald’s Scott Lauber. While owner John Henry said he’d blow past the threshold for Jon Lester, it’s unclear if he’ll do the same for lesser talents. The Sox could still benefit from an ace, so expect GM Ben Cherrington to monitor the markets of Max Scherzer, James Shields, and Phillies trade target Cole Hamels. The Dodgers are about to sign Taiwanese righty Chin-hui Tsao, who hasn’t appeared in the Majors since 2007 and hasn’t pitched professionally since 2009, when he was banned from Taiwan’s top league amidst allegations that he tried to help fix games. MLB has looked into Tsao’s case and allowed the Dodgers to pursue him, and that might be a mistake, Yahoo! Sports’ Tim Brown writes. Major League Baseball is typically very strict about the appearance of game-fixing (as Pete Rose’s situation suggests), and allowing Tsao to play, even on a minor-league deal, would set a strange precedent. Here are more notes from the NL West. Before today, there were already rumors about the possibility that the Rockies could trade Wilin Rosario, possibly to an American League team. After Colorado agreed to terms with fellow catcher Nick Hundley today, those rumors seemed ever more likely. But ESPN’s Jerry Crasnick tweets that the Rockies are telling interested parties that they will keep Rosario unless they’re blown away. Obviously, that could simply be a negotiating stance on the Rockies’ part. It seems unlikely that the Rockies would begin the season with Rosario, Hundley and Michael McKenry all on their active roster. Of all the extra outfielders in San Diego, it’s not surprising that the Padres traded Seth Smith first, Jeff Sanders of the San Diego Union-Tribune writes. Unlike some of San Diego’s other surplus outfielders, Smith had value in a trade (as the Padres’ acquisition of a power arm in Brandon Maurer suggests). Also, he was owed $13MM for the next two years despite having no clear role with the team. The Reds have announced that they’ve acquired Phillies outfielder Marlon Byrd and cash from the Phillies for righty prospect Ben Lively. The Phillies will pay half of Byrd’s $8MM salary in 2015, and nothing on his $8MM club/vesting option for the following year. Earlier this week, FOX Sports’ Jon Morosi reported that the Reds and Phillies had discussed a Byrd deal that ultimately didn’t take flight. It appears, however, that they finally found common ground. The Reds have traded Mat Latos and Alfredo Simon this offseason and have added few significant players of their own. An outfielder to add to Jay Bruce and Billy Hamilton was high on their shopping list, though, so it’s no surprise they’ve agreed to a trade for Byrd. After an excellent 2013 campaign with the Mets and Pirates, Byrd kept hitting in 2014, batting .264/.312/.445 with 25 homers for Philadelphia. He’s average to above average defensively in a corner outfield spot, although he has mostly played right field recently and will be asked to play left in Cincinnati. Byrd had also frequently been connected to the Orioles this offseason. Lively, 22, was the Reds’ fourth-round pick in 2013 out of the University of Central Florida, and he’s quickly made his way through the minors, spending 2014 with Class A+ Bakersfield and Double-A Pensacola. Overall, he posted a 3.04 ERA with 10.2 K/9 and 3.1 BB/9. MLB.com ranks Lively as the Reds’ eighth-best prospect, noting that his stuff overwhelming but that he does have four good pitches and hides the ball well. FOX Sports’ Ken Rosenthal, who initially tweeted that the teams agreed to terms, als noted that the amount of money the Reds will receive was significant. CBS Sports’ Jon Heyman tweeted immediately before the deal that the two sides could soon reach an agreement. The Phillies have shown interest in free agent righty Aaron Harang, Jim Salisbury of CSNPhilly.com tweets. The 36-year-old Harang has also lately been connected to the Braves and Rockies after a surprising comeback season in Atlanta in which he threw 204 1/3 innings with a 3.57 ERA, 7.1 K/9 and 3.1 BB/9. Homer-happy Citizens Bank Park might not be the best place for Harang to continue that renaissance, however — his 37.8% fly ball rate in 2014 was his lowest since 2003, but he’s still a pronounced fly ball pitcher. Still, he could potentially provide the Phillies with a bit of stability in the back of their rotation. In any case, Harang had to take a minor-league deal last offseason, but that won’t happen again this winter, despite his advanced age. MLBTR’s Zach Links predicted in October that Harang would receive a two-year, $14MM deal.